4K resolution videos are very much in demand, so is the Ultra HD converter software. When you try to transfer the Sony, Canon, Panasonic 4K videos to FCP X, WMP, VLC, QuickTime etc for further editing or playback, or if you want to put the downloaded 4K video movies to iPhone iPad Android devices to enjoy on the go, you will need a 4K video converter. But the same as 4K videos, the qualified 4K converter program is very limited. Here we introduce five top 4K ultra HD converters to help convert 4K to 1080P/720P MP4, AVI, MKV, MOV and more. Why is 4K Video Converter Required? While 4K may very well rule the roost in that regard of image quality, it lacks the ability to host various mobile devices. Currently, the devices that support 4K videos playback are rather limited and the 4K video players are still rare, even the popular iPhone iPad are out of luck. More importantly, the more pixels means the large file size, namely, a short 4K UHD clip can easily be GigaBytes in size. Given that most mobiles and players fail to play 4K UHD videos, plus the large file size of 4K videos, to transcode 4K 4096x2160 or 3840x2160 to HD 1080P/720P with a proper 4K converter is a must-have option. Which is the Best 4K Video Converter? Sure, several reliable 4K Ultra HD video converter has been designed to help users play 4K 2160p videos easier. 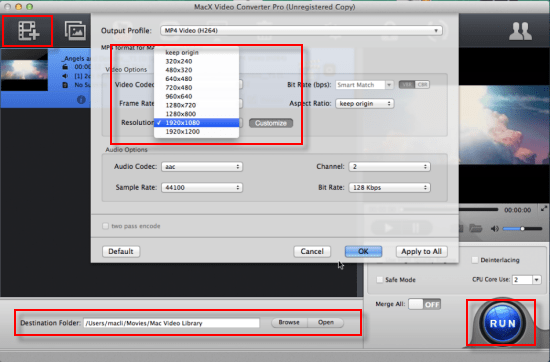 To save your efforts looking for the suitable 4K video converter, here MacX Video Converter Pro is recommended. This professional 4K converter tool goes in advance of others to pace with 4K/8K UHD support. It can smoothly compress and convert 4K UHD 2160p to HD 1080p, 720p, SD 480p/540p MP4, MKV, AVI, MOV, FLV, WMV etc, be the 4K videos taken by professional camcorders, digital cameras, mobile phones or tablets, or downloaded from online sites. The editor function will further reduce the large 4K video file size to 70% smaller with features like trim, crop, merge, rotate, watermark, subtitle etc. Besides, the built-in High Quality Engine will maximize the quality of the output 4K UHD converted videos and Intel QSV/Nvidia/AMD hardware acceleration tech will accelerate 4k video conversion speed up to 16X faster than before and 5X faster than any other 4K video converters (NO.1 fast). In addition to compress 4K to 1080p/720p SD videos, this 4k converter software also serves as a good 4k content downloader, which helps users to free download 8K/4K 2160p UHD/1080P HD samples, contents, videos, movies, clips from YouTube, Facebook, Dailymotion and 300 more video-sharing sites in fast speed; and further convert the downloaded 4K videos to suitable formats and compress UHD files to smaller size with maximum quality. To enjoy the high definition clips, users no longer to get paid 4K contents on Netflix, Amazon Prime Instant, Amazon Instant etc. Step 1: Free download this Ultra HD video converter (macOS Mojave), or windows version for PC users (Windows 10 incl.). Launch it and click "Add File" to load the 4K UHD video files you want to convert. Step 2: Select the output format and resolution to convert 4K video or Ultra HD video to HD MP4, MOV, AVI, WMV, MKV, etc. in 1080p or 720p. You can also further compress/reduce the 4K UHD video files by customizing video resolution to "1280*720" or "1920*1080" more or aspect ratio to 16:9 for playback on 4K UHDTV, or adjust other settings to reduce the UHD video file size. Step 4: Click "RUN" button and this 4K converter tool will start to compress convert 4K videos to 1080p, 720p, MP4, MKV, AVI, MOV etc on your Mac. Note: As we mentioned earlier, in addition to transcode 4K Ultra HD videos, 4K camera videos, and web downloaded 4K videos, this 4K converter software also works as a reliable 4K 2160P video downloader and 4K video editor. So if you want to download and convert any 4K videos to your mobiles or players, click YouTube button on the 4k video converter and easily download 4K contents first and then convert as per the guide above.